We just want to say a giant thank you to Laura and Corey for our wedding. Everything ran so smoothly on the night and the tables and decorations were perfect. We also received many comments from our family and friends on how great and helpful you two were! So once again thanks, we had the BEST time. Laura and Corey were the incredible team behind our on-the-day coordination. 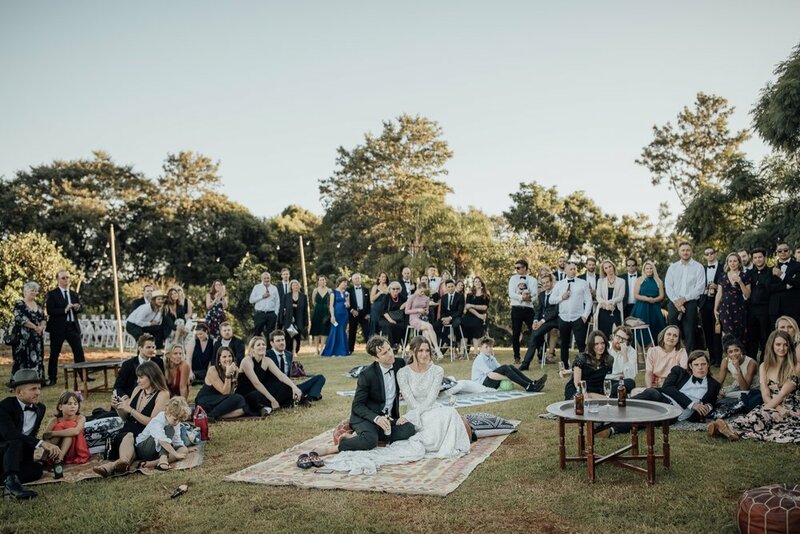 Adam and I planned the wedding on my grandparents farm in the Byron hinterland remotely from New York, and were grateful to have many friends and family helping us out from afar. The missing piece of the puzzle, however, was to have someone on site at the farm who could be the point person for the day while we were in Byron getting ready for the wedding with our families. All the best from Leilani and Adam! We don’t even know where to start! We have so much love and appreciation for everything that you did for us. Thinking of the wedding still makes us smile and a big part of that is because of all the work you put in to making sure that the preparation and the actual day was easy and ran effortlessly. We had a rough idea in mind for the day, but very quickly the process became more overwhelming and stressful than anything else. After speaking with you, Laura, we were immediately at ease and excited. With your knowledge of the industry and experience with reliable vendors, you were able to bring our vague descriptions to life. If vendors weren’t able to deliver what we wanted, weren’t within our budget or made unplanned changes, you stayed calm and managed it all, making sure that we still got everything we were after. It was such a fun relaxing experience and there is not one part of it that wasn’t perfectly us - you made sure of this! The only hard part of the experience was saying goodbye when it was all over. You are amazing and we cannot thank you enough! Simply the best! From our very first contact we knew the husband and wife team at Elle & Sea were the perfect match for us – we totally connected from the out set. Laura and Corey had the vibe, vision and practical understanding that helped make our wedding the most treasured day of our lives. It was a pleasure and a privilege to partner with them. 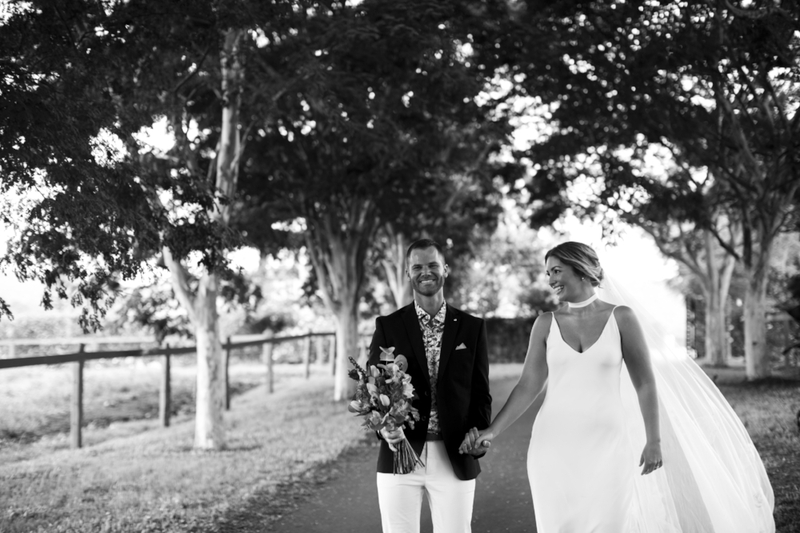 Laura and Corey took all the stresses out of planning a wedding in Byron Bay from the other side of the world (London). This included visiting venues, communicating with vendors, price comparisons / cost analysis, styling ideas and all the necessary logistics on the day itself. Laura was amazingly flexible in her approach and demonstrated excellent knowledge of the Byron Bay region that proved invaluable throughout the entire planning stage. Something that really stood out to us was their ability to work within our budget and ensure that we got the best quality vendors for the right prices; no hidden costs, full transparency and complete integrity. This also showed on our wedding as we didn’t need to worry about a thing – they had it completely sorted – nothing was an issue rain, hail or shine. We are still buzzing on how epic Laura and Corey helped make our wedding. They are personable and down to earth … so much so they are now like friends not wedding planners! Thank you for everything you did for us Laura and Corey. You were an absolute hit with our family and friends and we couldn’t have asked for better!! Absolute legends. You made our day! Thank you for always being available in the lead up to discuss any detail, and when the forecast for the wedding day looked gloomy, you helped us put a cheery spin on it and make it the best wet wedding possible. Your help on the day was so seamless. Some people say good wedding coordinators blend into the background but you are both such lovely people to be around that we wished there was even more time to chat with you on the night! Thank you so much again and we would recommend you to anyone wanting a reliable and fun-loving, husband and wife team! 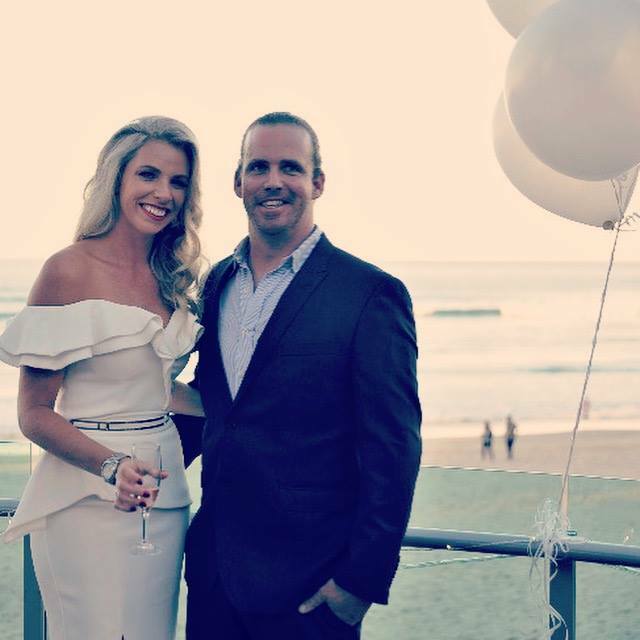 Thank you so much for your beautiful work with our engagement party. You made my ideas come to life and the venue looked so much better than if I had set it all up myself! Awesome work for convincing me to hire the big screen and for putting the palms and balloons on it so perfectly. It was such a winner on the night for photos and speech backdrops. EVERYONE commented on how beautiful it all looked and were convinced we were also getting married on the night. If I ever need any help with another party I'll give you a call- you're worth every cent and much more! Thanks again for also being so easy to work with! So much love for you guys. Thank you so much for being a part of our special day. You put so much time and effort in to making sure everything was perfect. I knew immediately after our first meeting that I could trust you with whatever I had to throw at you for our wedding. You have a very high attention to detail. Everything you had set up for the ceremony and reception was perfect, including the daunting task of our ceremony music. You were nothing but professional and I received many compliments about you from my guests - so thank you. I would happily recommend you to any couples that need help with their big day!